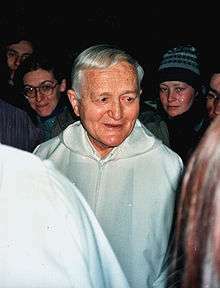 Roger Schütz, popularly known as Brother Roger (French: Frère Roger; Provence, Switzerland, May 12, 1915 – Taizé, August 16, 2005), was a Swiss Christian leader and a monk. In 1940 Schütz founded the Taizé Community, an ecumenical monastic community in Burgundy, France. He served as the community's first prior until his murder in 2005. Towards the end of his life the Taizé Community was attracting international attention, welcoming thousands of young pilgrims every week, which it has continued to do after his death. Brother Roger at prayer, 2003. He was born Roger Louis Schütz-Marsauche, the ninth and youngest child of Karl Ulrich Schütz, a Protestant pastor from Bachs in the Zürcher Unterland in Switzerland, and his wife, Amélie Henriette Marsauche, a Huguenot from Burgundy, France. In 1940, at the start of World War II, Schütz-Marsauche felt called to serve those suffering from the conflict, as his maternal grandmother had done during World War I. He rode a bicycle from Geneva to Taizé, a small town near Mâcon, about 390 kilometres (240 mi) southeast of Paris. The town was then located within unoccupied France, just beyond the line of demarcation from the zone occupied by German troops. He bought an empty house, where for two years he and his sister, Genevieve, hid refugees, both Christian and Jewish, before being forced to leave Taizé, after being tipped off that the Gestapo had become aware of their activities. In 1944, he returned to Taizé to found the Community, initially a small quasi-monastic community of men living together in poverty and obedience, open to all Christians. Since the late 1950s, many thousands of young adults from many countries have found their way to Taizé to take part in weekly meetings of prayer and reflection. In addition, Taizé brothers make visits and lead meetings, large and small, in Africa, North and South America, Asia, and in Europe, as part of a “pilgrimage of trust on earth”. The spiritual leader always kept a low profile, rarely giving interviews and refusing to permit any "cult" to grow up around himself. Prior to his death, Brother Roger was due to give up his community functions because of his advanced age and ill-health which had seen him suffer from fatigue and often use a wheelchair. Brother Roger was awarded the UNESCO Prize for Peace Education in 1988 and wrote many books on prayer and reflection, asking young people to be confident in God and committed to their local church community and to humanity. He also wrote books about Christian spirituality and prayer, some together with Mother Teresa with whom he shared a cordial friendship. I have found my own identity as a Christian by reconciling within myself the faith of my origins with the mystery of the Catholic faith, without breaking fellowship with anyone. Brother Roger was stabbed to death during the evening prayer service in Taizé on August 16, 2005, by a young Romanian woman named Luminița Ruxandra Solcan who was later deemed mentally ill. He was stabbed several times and, though one of the brothers carried him from the church, he died shortly afterward. The assailant was immediately apprehended by members of the congregation and was placed in police custody. The funeral took place on August 23, 2005. Horst Köhler, the President of Germany, and Nicolas Sarkozy, at that time Minister of the Interior of France, were in attendance. Brother Roger's community and friends attended the liturgy in the vast monastery church at Taizé, while thousands more followed it on a huge screen in fields outside the church. Brother Roger's simple wooden coffin, a wooden icon lying upon it, was carried into the church by members of the community. In a highly unusual move, the funeral of this Protestant monk was presided over by a Catholic cardinal, Walter Kasper, the president of the Vatican's Pontifical Council for Promoting Christian Unity, who celebrated the Mass with four priest-brothers of Taizé concelebrating. In his homily he said, "Yes, the springtime of ecumenism has flowered on the hill of Taizé." In reference to Brother Roger's concern for social justice, Cardinal Kasper said "Every form of injustice or neglect made him very sad." Brother Roger's successor, Brother Alois Löser, prayed for forgiveness: "With Christ on the cross we say to you, Father, forgive her, she does not know what she did." In 1998, Brother Roger had designated Brother Alois, a German who had originally come to Taizé as a youth and became one of the brothers, as his successor. This was confirmed by the community and in January 2005, it was announced that Alois would soon be taking Roger's place as Prior of Taizé, but this had not yet occurred at the time of Roger's death, when Alois was attending the World Youth Day celebration in Cologne, Germany. He was installed as prior shortly thereafter. 2005, Pressens-tu un bonheur ? / Do you expect happiness? Living today for God. (1962) Originally published under the title Vivre l'Aujourd'hui de dieu. Unity: man's tomorrow / by Roger Schutz (1962) Translation of L'unité, espérance de vie. 2004: Lambeth Cross , award of the ecumenical association of the Church of England, which is conferred on religious leaders who have rendered exceptional service to the cause of Christian unity. ↑ Simons, Marlise (August 18, 2005). 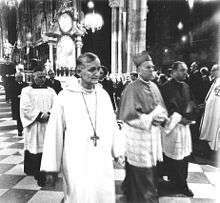 "Brother Roger, 90, Dies; Ecumenical Leader". International New York Times. Retrieved September 18, 2013. 1 2 Magister, Sandro (August 25, 2008). "Was the Founder of Taizé Protestant, or Catholic? A Cardinal Solves the Riddle". www.ChiesaOnline. ↑ Taizé: non-lieu psychiatrique pour la meurtrière présumée de Frère Roger Archived July 11, 2011, at the Wayback Machine. Wikimedia Commons has media related to Frère Roger.